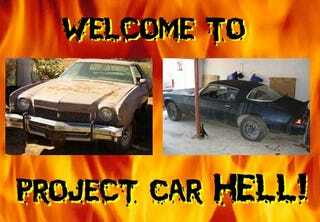 Project Car Hell, Enduro Edition: Monte Carlo or Camaro? Since our last Choose Your Eternity poll featured a 50.6% to 49.4% virtual dead heat at the time of this writing, with the 1976 De Tomaso Longchamp just barely ahead of the three Bitter SCs, and with the Jaloppers all fired up over the Pumkpin Smash enduro race, we figured it would be a good time to do a PCH featuring the two cars that seem to run neck-and-neck in the enduro world: the early Chevrolet Monte Carlo and the second-generation GM F-body. So put on your helmets and have the Sawzall, Pabst, and Project Car Hell Song handy, because we're going straight to Enduro Car Hell! Project Car Hell: One Longchamp or Three Bitters? The Chevy Monte Carlo has long been a favorite in the type of racing that favors cheapness, small-block Chevy power, and the rending of metal in front of a howling mob of liquored-up race fans. It's got tough body-on-frame construction, a 4-link rear suspension, and you can usually get one a lot cheaper than its Chevelle siblings. Since you can find endless engine/trans setups for chicken feed at any junkyard, we figure this '73 Monte for just $125 really can't be beat. In addition to the liberating absence of engine and transmission, it also gives a big middle finger to The Man and his constant demands for paperwork and red tape- no pink slip here! And the inside is "striped" (which we assume means "stripped" but perhaps not- maybe it has racing stripes painted on the door panels), so all you'd need to do is trade a litter of pit bull pups for a roll cage installation and you're just about ready to bash into all the other Montes on the track! The second-generation (1970-81) Chevy Camaro and Pontiac Firebird can't take quite as much punishment as the Monte Carlo, but they take the same engines, they handle a bit better, and they're a lot lighter. That means you'll be faster and more vulnerable to battle damage, and if that isn't what enduro hoonage is all about, we don't know what is! This '79 Camaro has the ideal combination of huge crash bumpers and the devil-may-care Billy Squier image most prized by the ladies at the track, so you really can't lose for the asking price of $600. Sure, it's more than four times the price of the Monte, but you get a V8 and a four-speed as part of the deal (we're assuming the engine is a 305 but, given the mix-and-match nature of small-block cars, it might be a 400). The seller is motivated, because for some weird reason his apartment complex's manager is being a totally unreasonable hard-on about having a basket-case Camaro sitting in the parking garage- imagine that! We're sure your neighbors will be far more understanding when you drag this fine racing machine home.